I learned this sweet baby-calming song from my colleague Kate during a meeting of children’s librarians. She made quite an impression on us. The Jbrary duo recorded the song, and I promised the musicians among our team that I’d figure out the chords. Have a listen to Dana and Lindsey. The original is by Cathy Bollinger, from her 2005 album Toddlin Tunes, but the simplified storytime version sounds quite a bit different, and only covers the first verse. This week we’re celebrating Lunar New Year and Valentine’s Day with a song that always reminds me of childhood thanks to Sharon, Lois, and Bram. I’ve significantly simplified the chords and transposed them into C to make them easier for playing in storytime. The most common version you’ll find online is in G, like this one at Doctor Uke, and is heavily influenced by Sharon, Lois and Bram. The original version was written by Felix Feist and Al Piantadosi in 1910 as part of a musical. This is the sixth in a series of love-the-littles songs. I learned this gentle lullaby from a beloved mentor/instructor back when I was in library school. 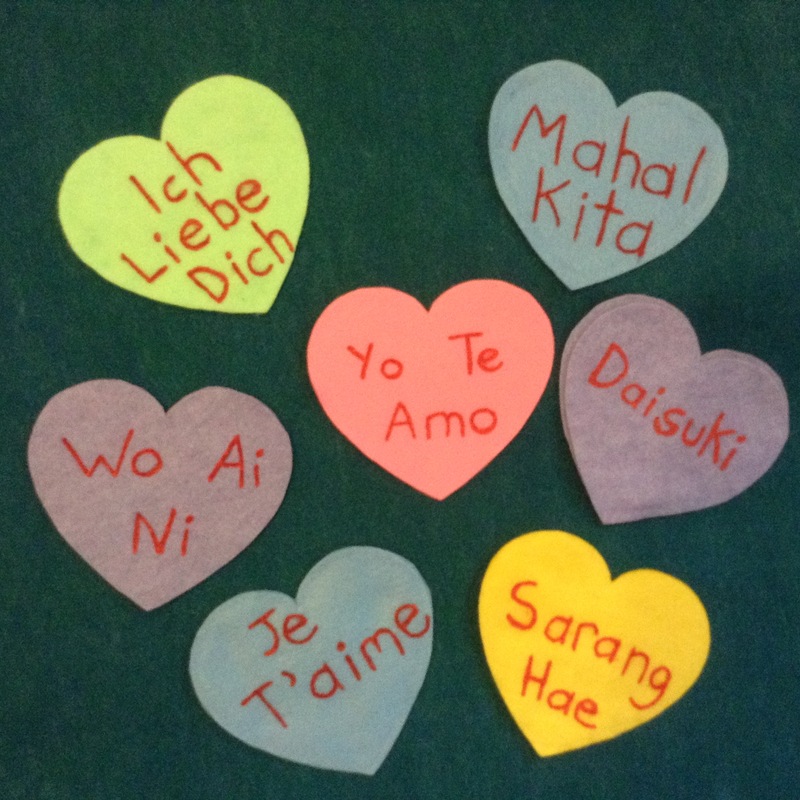 I love asking my storytime group how they say “I Love You” in their myriad home languages and then singing them all together. It’s a wonderful way to get to know each other, and glimpse the diversity in our communities. And of course, it offers a moment to reinforce what a gift it is to speak and sing to a child in their home language. 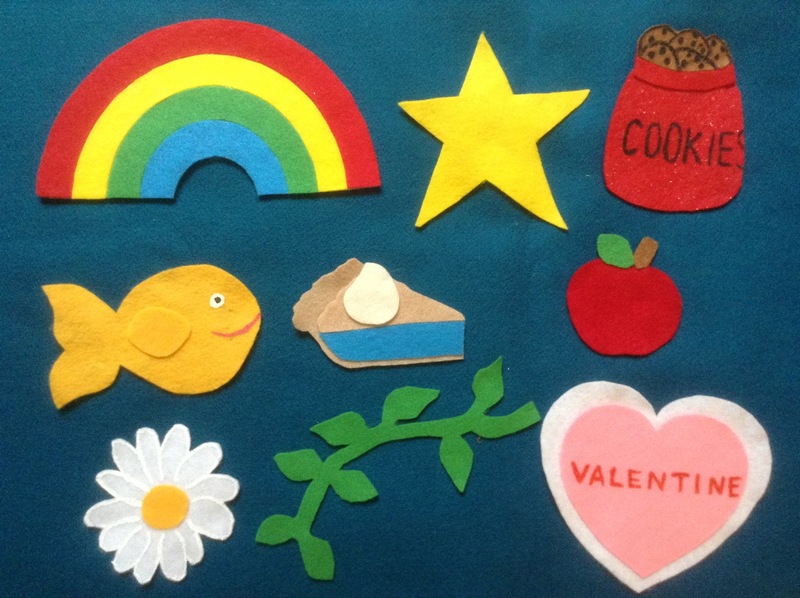 I used to write our group’s “I Love Yous” on a flipchart or white board, but I’ve just made some reversible felt hearts to put up while we sing. 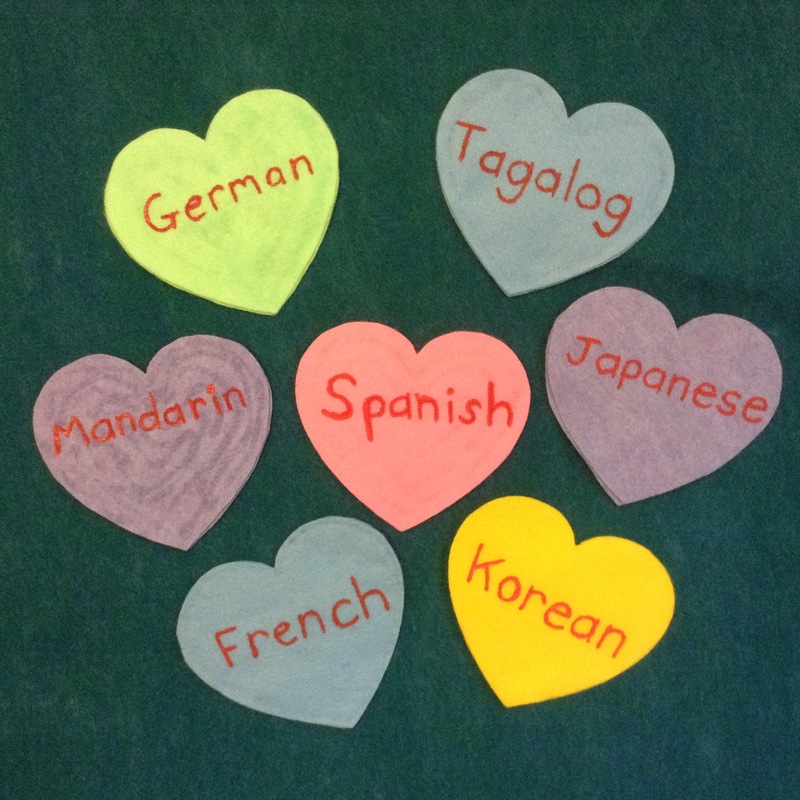 I’ve made a few extra blanks so I can keep up with new languages and phrases that the families volunteer. This song doesn’t seem to be too well known but one of my colleagues recorded it at a rhyme-sharing workshop, and you can listen to it here. Update: You can now see my friends at Jbrary singing this as well. Thanks Dana & Lindsey! Also, I’ve learned the song origin, and can finally credit Uncle Ruthie Buell. It’s from her album Take a Little Step. We’re participating in Flannel Friday again, so check out this week’s roundup at What Is Bridget Reading? This is the fifth in a series of love-the-littles songs. The Lunar New Year is a big celebration in my city. So with the new year just over a week away, we’re featuring a fitting lullaby love song for the little ones. I generally only sing lullabies at babytimes, but if your toddlertimes are mellower than mine, you might want to sing it with them too. This song was written by Meredith Willson in the 1950s. Sometimes you’ll hear “God Bless the Moon” sung to the same tune, but this version is quite secular. This is the fourth in a series of love-the-littles songs. This song has been hugely popular at a couple of my colleagues’ baby and toddler programs, and I sing it at home with my own little dude. It’s from Kimya Dawson’s 2007 album Alphabutt, which is full of fantastic, ridiculous, silly, lovely songs, plus the best pregnancy song I’ve every heard. Make sure your library owns it! This is the second in a series of love-the-littles songs. I’m settling into this new year with a celebration of love for all our little ones. The next six weeks I’ll be posting a series of lovey storytime songs. To begin, here’s a song you might not even know has a tune. It comes from Robert Munsch’s Love You Forever. This is not a book I’m likely to read at storytime as it’s too long for my demographic, the pictures are too small for my busy programs, and I’d probably cry. But next time I lead a Babytime session, I’m going to try singing the song from the book. If you don’t know how it sounds, listen to the author singing it during this interview. Or if you sing it in your own unique way, send me a recording and I’ll try to fumble out a few chords for you. This is the first in a series of love-the-littles songs.